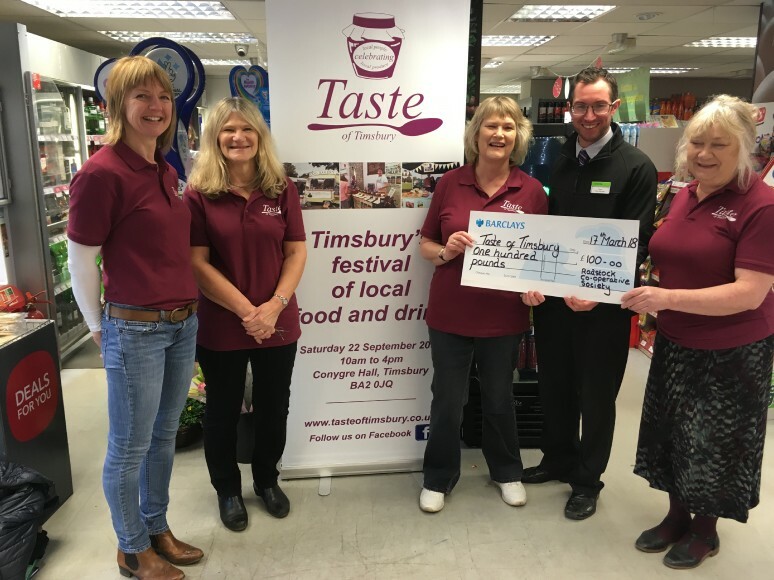 The team behind the third Taste of Timsbury festival of local food and drink have confirmed that this year’s event will take place on Saturday 22 September at Timsbury’s Conygre Hall, from 10am to 4pm. Entry is free. Radstock Co-operative Society have generously donated £100 towards the cost of running the festival, and the picture shows Owen Holland, manager of the Timsbury store, presenting the cheque to the organisers of the festival. “We are really grateful to Radstock Co-op for their donation. It means such a lot to us - as this is very much a local festival, we are delighted that our local Co-op is actively involved and their donation will help cover the costs of putting on this event,” said the organisers. A spokesperson for the Society said, “We are delighted to be able to offer some sponsorship for this community event which will bring residents of the local area together in support of local suppliers and producers”. As in previous years, there will be numerous stalls inside the hall and in a marquee on the recreation field, plus street food stalls, cider and beer bars. Samples of locally-produced food and drink will be available to try and buy, and there will also be an emphasis on healthy living, community involvement, growing your own food and cutting down on food waste. There will be cookery demonstrations and a foraging walk, children’s activities and displays of livestock including bees and rescued caged hens. Once again there will be a raffle, with some really fantastic prizes. For more information, see the website www.tasteoftimsbury.co.uk or follow Taste of Timsbury on Facebook.